I put down the phone, and started pacing up and down the room, still reeling from the bombshell dropped by the groom. It was no use trying to kid myself. She wasn’t ‘just another wedding soloist’. But after the first rehearsal of her two pieces (Gounod’s Ave Maria and You raise me up), I realised I needn’t have worried. Susan’s two PAs were delightful people and incredibly efficient in arranging practices. And Susan herself was a joy to work with. There’s nothing better for an accompanist than a trained soloist with a beautiful voice who knows exactly what she’s doing. Also, the big advantage of her fame was that I could check Youtube for answers to any technical queries. However, there was another challenge to face. As it happened, the parish choir had already been booked by the couple to boost the hymns and Mass parts. And of course, when Susan Boyle sings You raise me up there is usually a choir in the background. In this case, therefore, the general feeling was that it would be a bit odd to have a choir present which didn’t join in with You raise me up. Would our choir consider it? At first, I was doubtful whether a small parish choir could emulate the singers backing Susan on Youtube. On second thoughts, however, perhaps a bit of re-arranging and a specialist coaching session might help us to put in a respectable performance. 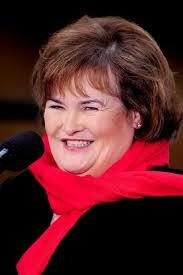 So the word went out to the choir: if you want to sing with Susan Boyle, you must come to all practices. The response was a general ‘Wow! Yes, we’ll be there!’ One soprano even arrived on crutches, having strained her leg in a fall at work. ‘I wasn’t going to miss the chance of singing with Susan Boyle’, she said, as she hitched her way into the church. I simplified the choir part and organised a bit of expert instruction. We had two intensive practices before the final one with Susan herself, which was also attended by the couple and their families. To my relief Susan liked what we’d done, and the choir warmed to her cheery comments. On the day, the music went smoothly, apart from an annoying technical hitch with one of the organ stops, which probably went largely unnoticed. The logistics also worked, in what is really quite a small gallery. The unusually numerous choir were all in their allotted seats (some on cushions along the deep window-ledge). Susan sang with her usual power and skill from the front of the gallery, and everything was enhanced by the resonant acoustic of the church. All in all, working with Susan Boyle was a lovely experience for choir and organist to remember, and we wish her well for her forthcoming American tour. Thank you for sharing this with us. What a joy it would be to hear her sing those songs in your church! Yes, Jean, it was very special indeed having Susan sing in our own church, and quite unexpected. The couple had said they had a soloist in mind, but they didn’t give a hint about who it was until the phone call that sent me reeling! But it was a great experience for all of us. ‘You raise me up’ sung by Susan is lovely, Betsy, and we all did our best to give her the backing she deserved. A recording would have been nice, but it might have made us even more nervous! Dear Evelyn, I wanted to take this time to say ‘Thank You’ for posting this very precious recap of your experience with the lovely Susan Boyle. Susan’s team is a VERY warm and welcoming bunch. They make everyone feel so special, even if they have met a person for the first time. How very wonderful that even the choir were able to be part of a lovely and precious experience. Dear Evelyn ~ Thank you so much for this lovely account. I’m delighted for all of you ~ and, of course, for Susan and for the bride and groom!